THE SKINNY: Do you really need a special toothpaste before bed? 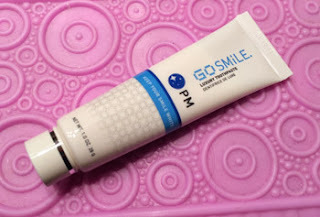 That was the thought that went through my head when I opened a sample bag and found the tube of Go Smile PM Toothpaste. And I think my instincts were right. While the toothpaste is fine -- although a little grittier than when I am used to -- I am not sure why I need a special tube for PM. And I really could not tell any difference in the look or feel of my teeth after using it for a week. Plus, this is one pricey paste compared to a couple bucks for Crest at the grocery or drug store. KEEP OR TOSS: Keep but I won't go looking for more. CHECK IT OUT: Go Smile is available at Ulta and also has an AM formula.